On April 10, 1968, a sell-out crowd witnessed a girls tag team match headlining the card. In addition to the main event, three other matches were on the card. 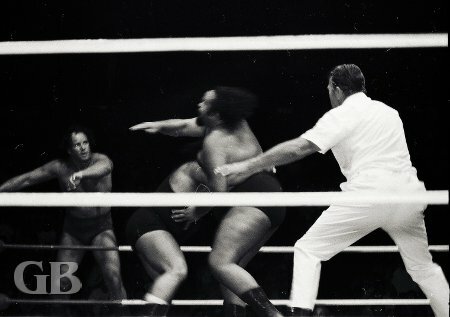 In the opening match, Ripper Collins defeated Frankie Allman and Peter Maivia won two out of three falls from Jerry London. 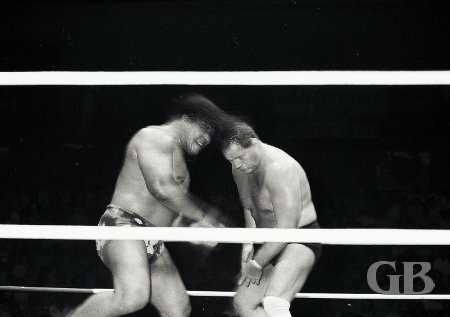 Peter Maivia headbutts Jerry London. A lei'd Missing Link signs autographs for fans. The semi-main event featured a men's tag team match with former enemies Johnny Barend and Curtis Iaukea teaming up to do battle with the current Hawaiian tag team champions Jim Hady and The Missing Link in a non-title match. After each team won a fall, time ran out and the match was declared a draw. 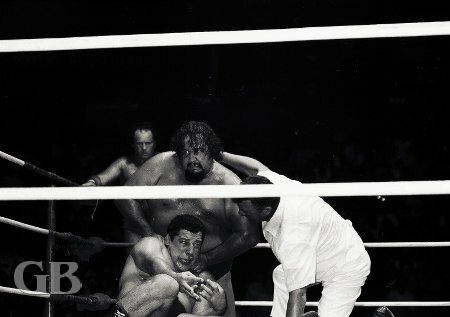 Curtis Iaukea applies a vicious nerve hold on Jim Hady. Curtis Iaukea stretches to tag Barend while in the clutches of The Missing Link's infamous Bear Hug. The Missing Link and Jim Hady win a fall. Referee Pete Peterson watches Johnny Barend carefully as the Missing Link looks for a submission with his Bear Hug. Jim Hady gets out of the way as he flips Curtis Iaukea. The main event, a lady tag team match, pitted The Fabulous Moolah and Betty Boucher on one side opposing the duo of Joyce Grable and Pat Sherry. The Grable/Sherry team took the first fall and the Moolah/Boucher duo evened up the match by taking the second fall. The team of Grable and Sherry won the third fall when Moolah and Boucher were disqualified for fighting with referee Wally Tsutsumi. Pat Sherry and Joyce Grable sign autographs before the match. Betty Boucher (left) and Moolah attack Grable and Sherry before the match begins. A careful Joyce Grable confronts The Fabulous Moolah in the corner. Referee Wally Tsutsumi separates Joyce Grable and Moolah as Betty Boucher works over Pat Sherry in the corner. Joyce Grable about to flip Moolah with a leg scissors. Pat Sherry waits for the bell between falls. Everyone piles on Betty Boucher. 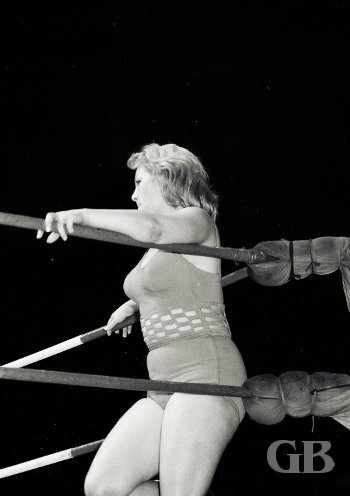 The Fabulous Moolah reaches through the ropes to break up Joyce Grable's pin attempt on Betty Boucher.